RIO DE JANEIRO, BRAZIL – Two days ago U.S. President Barack Obama announced plans to make life easier for Brazilians wanting to visit the United States by eliminating the need for certain categories of traveler to undertake an interview prior to entry. This, and increases in staff at U.S. Consulates in Brazil will speed up the process for Brazilians looking to travel to the U.S. significantly. Brazil to have much faster U.S. visa process, image recreation. The new plan will also be offered to Chinese citizens as part of a bigger aim to improve the U.S. visa processing capacity for the two emerging nations by 40 percent by the end of the year. 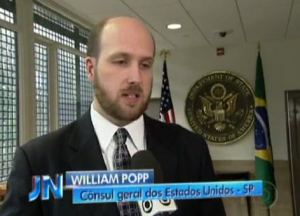 The U.S. Consul in São Paulo, William Popp, also announced yesterday plans to bring in 50 extra members of staff to help processes visa requests, spread between the three consulates in Rio, São Paulo and Recife, and the embassy in Brasília. Now eighty percent of the candidates in Brazil should be interviewed in less than three weeks. “The result will be increased for visa interviews from the current 3,000 to 4,500 per working day until June.” said Popp. Dennis Hearne, the U.S. Consul General in Rio de Janiero explained between October 2010 and October 2011, the Consulate in Rio saw a 72 percent increase in the number of visa appointments per day.